What is the direction of the velocity of a negative charge that experiences the magnetic force shown in each of the three cases in Figure 22.57, assuming it moves perpendicular to $B$. 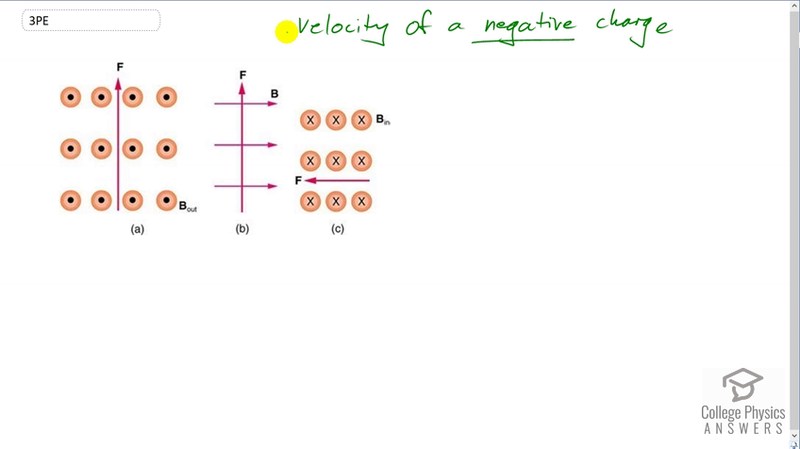 Figure 22.57 Find the velocity of a negative charge given the force and magnetic field shown. This is College Physics Answers with Shaun Dychko. We're going to determine the velocity of a negative charge using the right hand rule for each of these three scenarios. Now I've written a reminder to myself that we're finding the velocity of a negative charge and that's important to keep in mind, because our Right Hand Rule will give us answers for positive charges. And so we need to take the opposite to whatever answer we get from our Right Hand Rule in this case since we're doing it with negative charges. Some students and teachers might approach this using a Left Hand Rule and that would give a correct answer but I don't recommend it because, we should always be using the right hand because you never want to get confusion as to which hand you should be using. So let's be consistent and always use the right hand, I think. And if we're dealing with the negative charge then in that case take the opposite answer. But whatever works for you in the end, but I'm going to say Right Hand Rule. So, we have our palm of our right hand directed upwards in the direction of the force. Our fingers have to come out of the page because fingers align with the magnetic field direction and these dots represent an arrow tip coming towards you out of the page. So that's the direction of the negative field lines. And our thumb is pointing to the left and our answer is to the right. This is the velocity of a negative charge because since the right hand rule had our thumb pointing to the left, the left is the direction a positive charge would move to get a force upwards with magnetic field lines coming out of the page. But since we're dealing with negative charges, we take the opposite answer with our Right Hand Rule would say. In part b, we have our palm facing upwards again and this time our fingers are directed to the right. And so our thumb is pointing out of the page, and we therefore say that since it's a negative charges or velocity of the negative charges are into the page. So, we draw exes to represent these negative charges moving away from us into the page. This exes are the tail feathers of an arrow moving away from you. And then in part c, the palm is to the left. The fingers are into the page. And the thumb is pointing upwards and so our answer is downwards since we want negative charges here. And that's the velocity in part c, it's downwards.